That's all well and good, but let's have a bit of a look under the hood on this thing. In the first part, FHQ will look at those states named above that have expressed an interest in the possibility of a southeastern regional primary. 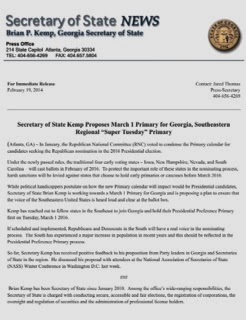 The date that Secretary Kemp has proposed for what has been affectionately called the SEC primary is March 1. That is the first date on which states other than the four carve-outs -- Iowa, New Hampshire, Nevada and South Carolina -- can hold delegate selection events under the actual (RNC) or expected (DNC) rules. In other words, that may be an attractive landing point for any number of states (see Super Tuesday on February 5, 2008). As of now, March 1 already has a southern flavor. Oklahoma, Tennessee, Texas and Virginia are scheduled for that date according to current state laws in each. Adding Georgia to the mix gives the South the clearest and strongest regional voice on that date. That would make five out of the eight states southern with Massachusetts and Vermont serving as only a token regional counterweight. But what is the likelihood that others (from the South) join those four (or five if one counts Georgia) on March 1? Georgia is unique in that the state legislature ceded the authority to set the date of the Peach state presidential primary to the secretary of state in 2011. That makes Georgia like New Hampshire in that regard. Basically what that transfer of power means is that Georgia, like New Hampshire, is better able to move its presidential primary around without the potential for gridlock or just inaction on the part of a state legislature. Getting Georgia to March 1, then, is an easier task than it will be for other states. And there will be something of a dilemma in the other states to whom that Secretary Kemp has reached out. Alabama, Arkansas, Louisiana and Mississippi will have push a date change through their legislatures. Secretaries of state in each of those states can (attempt to) initiate the legislative process on such moves, but that is no guarantee that there will actually be any shifting. The reason there is no guarantee is that such a proposal raises questions about the expected utility of a move. Alabama, Louisiana and Mississippi are already in March. What difference does it make to move up a week (as is the case in Alabama and Mississippi) or two-ish (for Louisiana's now customary Saturday primary)? In Alabama and Mississippi, the expected cost or benefit of a move may or may not be financial. Both are already in March, so the trade-off is more a matter of going with a larger group of southern states and risking getting lost in the shuffle or sticking with a smaller subregional primary on a date a week later when they may collectively and effectively counterbalance the Ohio primary on the same date. That is a tougher question to answer when both dates -- the first and second Tuesday in March -- are potentially attractive landing points on the calendar for a number of states. Getting lost in the shuffle may be a foregone conclusion when it is all said and done and the calendar is finalized in late 2015. The gamble is similar in Louisiana in that the internal debate is a function of choosing between a date where they may have a greater share of the spotlight later on (if the nomination races are still going in late March) and a date when many other southern states hold their contests; a proposition the nets the Pelican state some regional clout but not necessarily direct attention from the candidates. The situation in Louisiana is complicated by the fact that the state has utilized a Saturday primary the last two cycles. Part of that is designed to reserve a spot on the presidential primary stage where Louisiana stands alone or with other smaller and/or caucuses states. The spotlight favors them. Legislators in Arkansas face a slightly different calculus. First of all, the new RNC rules almost force Arkansas to consider moving up. Currently scheduled for the next to last Tuesday in May, the Arkansas primary falls at a point on the calendar after the cutoff for when primaries will need to be held to accommodate a late June or early to mid-July Republican convention. But that only adds to the classic late state dilemma: move everything up (presidential primary, state and local primaries and all) or create a separate presidential primary that is easier to move around (but also costs the state additional election funds)? Arkansas has twice gone the latter route (1988 and 2008) and twice has gotten essentially no bang for its buck, the extra expenditure got the state nothing in the way of advertising dollars or candidate attention. How ready and willing is Arkansas going to be to repeat that pattern? The alternative -- moving a consolidated set of primaries to an earlier date -- has its own pitfalls. Such a move impacts state legislators tasked with making the move in the first place. Moving a consolidated primary up lengthens a state legislators general election campaign. It also potentially means that the primary campaign overlaps with the state legislative sessions which means the primary phase campaigning will be happening during the state legislative session. Both potentially make legislators' decisions that much more difficult. Despite officials being open to the idea of a regional primary in the southeast, that does not necessarily mean that it will be enough to overcome the questions that will be raised during state legislative efforts to move primary dates for 2016 around. Those questions represent potential roadblocks in the legislative process that could derail movement to earlier positions on the primary calendar. Of course, that is not all that complicates the potential effectiveness of this proposal or its intended implementation. FHQ will examine the other issues attendant to this proposal that may pop up in the intervening period between now and 2016 in part two.